Philippe Karl and the School of Classical Dressage, Twisted Truths of Modern Dressage. 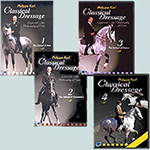 Philippe Karl and Classical Dressage, Classic versus Classique. "Riding instructions or légèreté - sport or art?" When Philippe Karl's book, "Twisted Truths of Modern Dressage” was published, feelings began to run very high. French instructor Philippe Karl (School of Légèreté) and Christoph Hess (head of the training department of the German National Equestrian Federation e.V.) have now met openly and without mincing words to discuss their individual points of view - a somewhat heated debate using actual practical examples of different riders and horses in the riding arena. The 135 minute DVD records the meeting, organized by Claudia Sanders, with the aim of not only documenting it but also of presenting it in a completely objective manner. Everybody can and should form their own opinion as to what "classic" riding really is. Philippe Karl and the School of Lightness (Légèreté). Riding in general, and dressage in particular, are truly "classical" only when they absolutely respect the horse´s nature. In his teachings as well as in his next book, Philippe Karl analyses the principles, methods and processes of modern dressage in the light of fundamental data from anatomy, physiology, locomotion, balance, psychology and behavioural research. This procedure helps to avoid meaningless concepts, empty phrases and the tyranny of prevailing fashions. • The dogmas that rule the official riding turn out to be highly questionable. This explains for the most part the tragic drifts of current dressage, the tremendous amount of broken horses, as well as the disillusionment of the riders and the frequency with which they give up riding altogether. • The concept of "Légèreté" ("lightness","ease"), which was worked out in all its aspects mainly by La Guérinière, Baucher, Raabe, Beudant und L´Hotte, corresponds to the requirements of the fundamental nature of the horse. In its true meaning, "Légèreté" is not a luxury that only appears at the end of the dressage of the horse and is reserved to artists riding excellent horses, but truly the most reliable means to show off each and every horse to its fullest advantage. From simple scientific data, corroborated by the in-depth study of the greatest masters, Philippe Karl draws up his own original synthesis, both for the dressage of the horse and the training of the rider: the "School of Légèreté". • It rejects the use of power and all constraining instruments ("muzzling" nosebands, every type of draw reins, side reins etc.). • It proposes a comprehensible and reliable dressage plan with clear principles, efficient methods and processes that are kind to the horse. • It refuses to exclude any type of horse and applies to all riding disciplines. • It makes high-level riding accessible to any serious rider, even with an ordinary horse. DVD 46 minutes. $49.95 plus s/h. Phillippe Karl's philosophy for his training methods are based on understanding the physical & mental conditions of the horse, the ease of the aids, the horse's movement. Phillippe's introduction to training covers: lunging, basics, easy in hand, aids, under the rider, and lateral work. School of Classical Dressage, Vol. 2 with Philippe Karl - The School of Gymnastics. In the second part of this schooling series, Philippe Karl presents additional gymnastic exercises. He introduces the double bridle as an important aid for advanced gymnastic exercises. Also covered: the canter, combined lateral work, show jumping, and flying canter changes. School of Classical Dressage, Vol. 3 with Philippe Karl - The School of Dance. In this third step of training, Philippe Karl uses the gymnastic exercises as previously demonstrated, to improve collection. He covers: pirouettes, piaffe, Spanish walk, and passage. School of Classical Dressage, Vol. 4 with Philippe Karl - Training Progress "One Year Later". DVD 57 minutes. $49.95 plus s/h. Shows the progress and development achieved by Sampaio (6 year old Oldenburger Stallion) and Quiela 7 year old Luisitano Stallion) who were featured in the first 3 Volumes of Classical Dressage. In this DVD Philippe Karl presents his ‘Ecole de Légèrete’ organization chart. His training philosophy is inspired by the most accomplished masters (la Gueriniere, Baucher, Beudant, L’Hotte etc) and founded on an absolute respect of the horse. Basic knowledge of anatomy, motion, balance and psychology enables the rider to get the best from any horse without using force or constraint systems (side reins, running reins etc). These films will open new horizons in the dressage world by demonstrating how misjudged and misunderstood the most brilliant ancient masters are at present. for just $159.95 plus $8.00 for s/h.